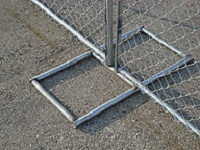 Chain Link Fences: Perfect for keeping unwanted animals and intruders from your premises. 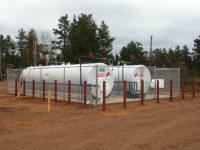 Available both galvanized and in a variety of colors, this is our most common type of fence. Read more here. Construction Fence: During construction, the public as well as construction workers must be protected until completion of the project. Available in free standing or driven, these fences cost a fraction of that of a permanent fence. Read More here. Ornamental Steel Fences: Great looking and maintenance free, these provide the security you need without blocking your view. Read more here. Gates: In need of a gate? Dairyland Fence makes their own gates, so you can get your own custom sized one. Read more here. Repairs: Fence got ran over? We can help! 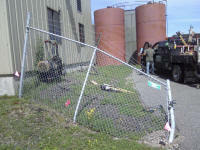 Dairyland Fence will either repair or replace the fence depending on the damage. Read more here. 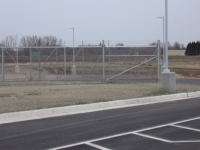 Copyright © 2015 Dairyland Fence Company Inc. All Rights Reserved.